Verve Senior Living offers superior retirement living in over 30 communities across the country. Residences feature life enrichment, superb care, health and wellness programs, and fine dining. Verve is also actively engaged in new developments and expansion, and its communities present a diverse portfolio of communities, with residences offering a range of care levels, residence sizes and locations. Residences are located in four distinct provinces across the country, from British Columbia to Ontario. At Dr. Hemstock Residence & Hearthstone Place, our highly-skilled group of health care professionals and qualified staff are here to do whatever we can to ensure that all your needs are taken care of. The Concorde has a warm and welcoming atmosphere with comfortable dining & excellent views of the mountains, along with extensive program activities; The Concorde is perfect for an active living & entertaining lifestyle. Located in the heart of a vibrant community, Holland Gardens is the perfect place to live, laugh and enjoy life. An exciting community offering a luxurious resort lifestyle, an ideal place for inspired senior living. Like a condominium, you furnish your suite with the comforts from your home, including pets. At Gilmore Gardens, it's the people, residents and staff alike, that make this independent senior living community so special. Credit River is a 6-storey condo style residence, with an array of well-appointed suite styles to choose from and our highly-skilled health care professionals are available around the clock if you need them. The Heritage Retirement Residence encompasses an active living & entertaining lifestyle with supportive & assisted living measures, Our highly skilled registered health care team will provide assistance when you need it. The Lodge at Valley Ridge is the perfect place for seniors to live, who want to maintain an active & entertaining lifestyle. Suites range from studios to 1 and 2 bedroom apartments with kitchenettes and balconies. Courtyard Gardens offers an enriching community, with quality staff & friendly & caring environment. 107 Private & Subsidized suites in Assisted Living, 31 Private Pay Extended Care studio suites & 1 Respite Suite. At Wintergreene you'll discover a combination of independence, privacy, activities, health and wellness programs & friendly companionship to savour throughout your retirement. You'll feel warmth as soon as you walk through the door. The Roxborough Retirement Residence is both elegant and cozy with a dedicated and caring staff that go above and beyond for your well-being and happiness. Canterbury Place offers a variety of suites styles in an elegant condo-like building for active adults & those needing assistance. We offer a unique healthcare program for our residents including palliative care. This award winning Oshawa retirement home is near parks and shopping, offering spacious seniors' suites and the option of assisted living care. Richmond Hill Retirement Residence offers full service including meals, housekeeping, active adult, independent and assisted living. Our focus is on maintaining good health, great food, new friends & lots of laughter! Lake Bonavista Village Retirement Residence is the perfect place for seniors to retire. You can choose from a variety of suite sizes in the main building or one of our unique cottages. Port Credit Residence situated in the Mississauga area offers seniors a luxurious resort-inspired lifestyle. Enjoy an oversized pool, wellness centre, onsite physiotherapy, a movie theatre, library, spa/salon and more! Living at Hawthorn Park Retirement Residence means you have choices & can customize the services you need, as you need them. We offer three lifestyle opportunities; supportive living, assisted living & complex care. Prince of Peace a variety of suites styles with kitchenettes and incredible mountain views. It's the perfect residence for seniors who are active, require some assistance, or have memory care needs. Stylish Mississauga retirement home offering independent, full-service and assisted living lifestyles, featuring a hair salon, onsite bistro and much more. Forestview Retirement Residence is North York's newest seniors' residence, set to open in March of 2018, we will offer Full Service Lifestyles & Assisted Living (on as secure floor). Call to reserve your suite today! Stouffville Creek is 118 suite retirement residence, a short drive north of Toronto, is conveniently close to major highways and features a fitness centre and more amenities. Four Elms is an elegant retirement residence, offering the finest in senior living. Choose a suite style that's right for you and enjoy an active lifestyle, fine dining and the company of good friends. Palermo Village is a luxurious 6-storey condo style residence that offers you the opportunity to enjoy a vibrant & active social life, while our chefs and skilled health care team focuses on your nutrition & well being. Located in Vancouver’s Kerrisdale neighbourhood, Granville Gardens offers residents the opportunity to stay active and live in a well-appointed urban community, surrounded by shopping centres, parks, community centres. Metcalfe Gardens Retirement Residence offers the perfect mix of old fashioned hospitality & an atmosphere that is full of excitement and vitality. Truly inspired senior living at its best, call to book a tour today! 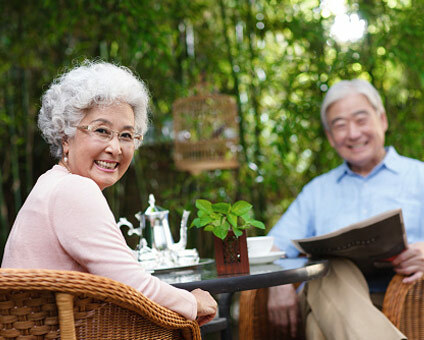 Thornebridge Gardens is one of New Westminster’s finest retirement residences, providing luxurious, worry-free surroundings with life enriching services that inspire healthy senior living. Many options are available! Trinity Lodge Retirement Residence combines the elegance & style of a fine traditional hotel, with the security & warmth associated with senior living. Homecare staff is available 24/7 to give you support when needed. Luxury and quality is in every corner of Hazelton from its lobby to its inviting Bistro & Bar. Offering amenities and services, Hazelton makes it easy for you to define and enjoy your lifestyle. The Richmond, combines an affordable lifestyle with comfort, security and friendly full service. You will feel a sense of warmth and know you are home the minute you walk in the door. Read how Verve Makes Every Day Great! Verve is a five-time winner of the Canada Award for Excellence from Excellence Canada. Allan Ebedes of Excellence Canada says that Verve "has demonstrated that it is one of the best managed in Canada." In receiving the award for 2015, John Carnella said, "This highly sought after award is affirmation that we are indeed, creating environments that are fulfilling for our residents." Verve Senior Living is an established leader in the senior care industry. Canadians moving loved ones into a Verve Senior Living community can have every confidence that care for their family member is in the best hands possible. All of Verve's Ontario retirement residences are licensed with the RHRA. Verve is also a member of the British Columbia Senior Living Association (BCSLA). What's the difference between active adult and independent living?